Peru is one of the most diverse countries on the planet, it has the Sierra in the Andes Mountains, the Jungle around the Amazon River and the Coast next to the Pacific Ocean. But if you are one of the people that are going to skip everything, to go directly to Machu Picchu in Cusco, and maybe you are interested in entering Machu Picchu … in a less conventional way. You can choose from some of the amazing treks to Machu Picchu, or other incredible walks in Cusco, among which are some of the most amazing hiking trails in the world. Why make a trek in Cusco? The walks in Cusco will take you to places with landscapes considered among the most beautiful on the planet , to some of the most amazing and unique places that exist. We may then use the word “astonishing” a lot, but you will notice that there is no other way to describe any of the places you might see, if you decide to take any of the Treks in Cusco, many of them end up in the Inca City Of Machu Picchu. If you already booked your trek to Machu Picchu and your tour through the beautiful Cusco City; It is time to tell you that there are many other amazing places in Cusco such as Ollantaytambo, Pisac and other places in the Sacred Valley of the Incas; Has Tipón and Pikillaqta in the South Valley and many other places inside and outside of Machu Picchu. The Incas worshiped the Pachamama (mother earth), so most Inca sites are built with great harmony with nature; Most of your activities will be in direct contact with her, so you should know how to make a responsible trip to Machu Picchu. And while touring Peru to reach Machu Picchu, do not forget that it is in the best gastronomic destination in the world. The Inca Trail to Machu Picchu is one of those experiences that can change your life, unique and unforgettable; One of the best walks in the world . 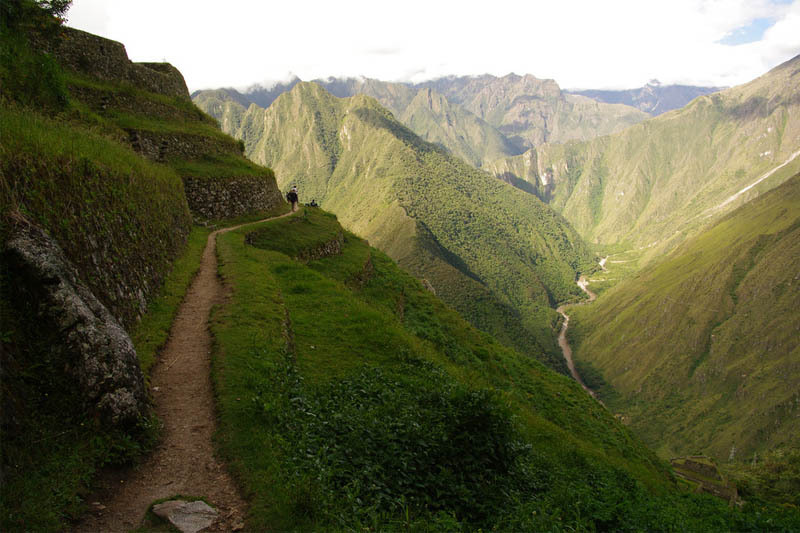 You will walk for 4 days to enter the Inca City of Machu Picchu. The Inca trails will take you through beautiful landscapes, with mountains, rivers, exotic vegetation, and flooded with Inca sites; Although it needs a good physical condition, it is a simply wonderful experience. However, if you want your first sight of Machu Picchu to be from Puerta del Sol (Inti Punku), but you do not want to walk for 4 days, you can choose the short Inca Trail (2 days). If you wish to enter Machu Picchu by the Inca Trail, or for any hike of your choice, please contact us at info@boletomachupicchu.com. Important: The income to Machu Picchu by the Inca Trail must be reserved 6 months before; Otherwise, it will be impossible to enter Machu Picchu through the Sun Gate. Many renowned publications place the Salcantay Walk among the 10 best hiking trails in the world; Although it is a challenge to cross the high mountain passes, an even greater challenge is not enjoying it. It is 4 or 5 days on the way to Machu Picchu, one of the highest mountain ranges in the Cordillera de los Andes. Although the Salcantay mountain, of 6.250 m. Of altitude, is one of the most beautiful mountains around Machu Picchu, not all people dare to challenge it. The Salcantay mountain is still venerated by the people of the Andes, as it was in the days of the Incas. Cross the Salcantay Mountain, beautiful mountain passes, a beautiful cloud forest, beautiful lagoons, and part of the Sacred Valley of the Incas to Machu Picchu. “El Ausangate” is the fifth highest mountain in Peru and is considered guardian of the City of Cusco since the time of the Incas; It measures 6,384 of height and during the centuries has received many names; But one that identifies it in Peru, is “Vinicunca” (mountain of colors) . But why that name? If you decide to walk along the trails of the Ausangate, the most important mountain in the Andean worldview, know that the Ausangate, the mountain of 7 colors , is one of the strangest and amazing places that exists, and is that it literally has 7 colors; Well, actually there are thousands of shades of these 7 colors, you can also see many species of birds and other native animals. It’s 5 days – or 4 days – where you can find yourself. In addition to Vinicunca (the mountain of colors), You can see snowy mountains, small turquoise lakes and enjoy delicious thermal baths. You can tour the mountain of 7 colors in Cusco, unique in the world, but surely still want to go to Machu Picchu. Then remember that Machu Picchu tickets must be booked in advance. If you are planning to travel to Machu Picchu in the coming months, here you can check the availability of tickets to Machu Picchu. The route through Huchuy Qosqo is one of the classic treks in Cusco ; The complex is settled on the Sacred Valley of the Incas, then the cities of Pisac and Ollantaytambo. When the Chancas, rivals of the Incas, besieged Cusco in 1438, the Inca left the capital of the Inca Empire, to take refuge in the Palace of Huchuy Qosqo , and at the time of the conquest Gonzalo Pizarro found an Inca mummy in Huchuy Qosqo , And ordered to burn it. It is one of the easiest treks in Cusco. This trek will take you through several archaeological sites and typical villages of the Sacred Valley of the Incas; But you can choose to stop at this place or continue along another path to the Historic and Natural Sanctuary of Machu Picchu . Only a few years ago, a French engineer who visited Machu Picchu, discovered a hidden door that thousands of people did not see. Just below the building of the three portals in the center of Machu Picchu, there is a secret door that could be the tomb of Pachacutec. However; Similarly, part of the Inca city of Choquequirao is still under enormous amounts of undergrowth, so more than a tourist excursion, it is an exploration trip to an ancient Inca city, considered the sister of Machu Picchu, by the impressive Similarities in design and architecture. Although it requires a good physical condition, it is an experience that every adventurous person should perform. 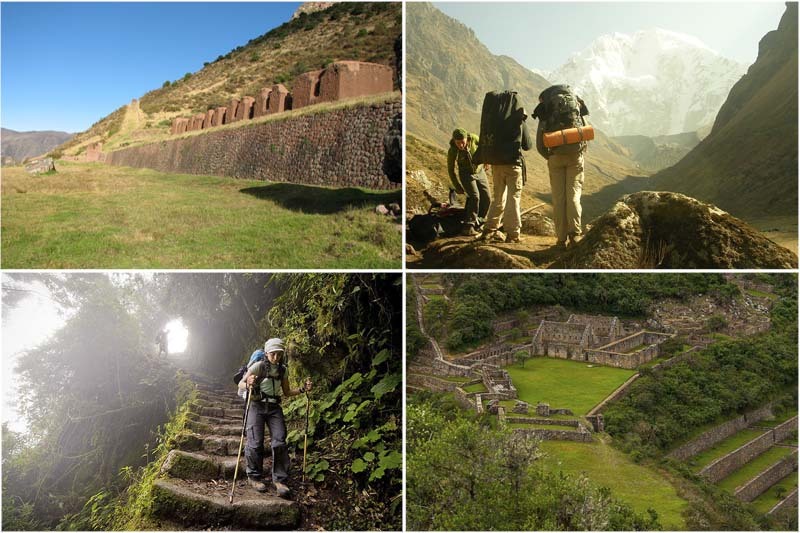 The Walk to the Inca City of Choquequirao is an unsurpassed trekking experience, and if it is not considered among the best treks in the world, it is because they still do not finish unearthing it; An enigmatic place whose history is still investigated. This walk takes 4 days, although there are shorter versions. And you can conclude with a dream ending in Machu Picchu. If you want something more adrenaline on your way to the Inca City of Machu Picchu, you can choose the Inca Jungle trek to Machu Picchu, 4 or 3 days. 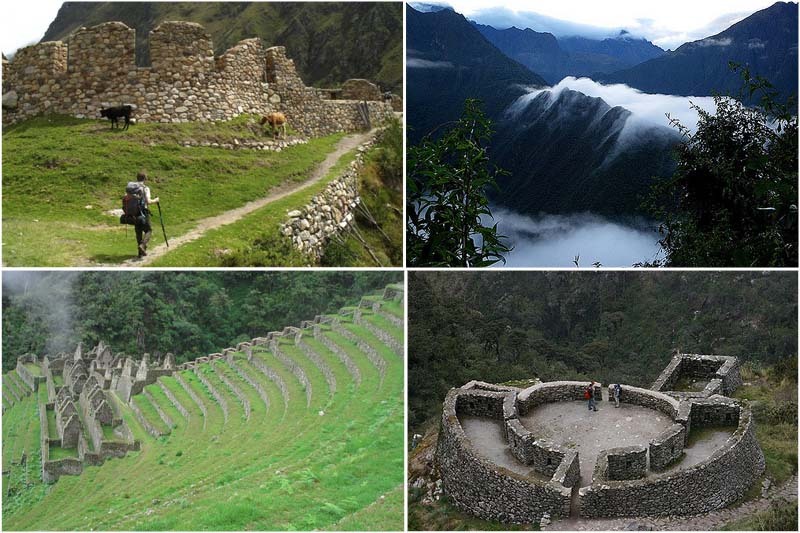 You will visit original Inca trails discovered only a few years ago; These unite the traditional and tropical villages of Santa María and Santa Teresa with the Inca city of Machu Picchu. The old stone paved roads are very well preserved by nature, and by local governments in Cusco. This hike mixes downhill cycling, rafting, zip-line (zip line), trekking, rafting (optional) and wonderful landscapes to Machu Picchu. The Inca Jungle bicycle ride is considered one of the best landscaping experiences in South America . Although the Lares Walk to Machu Picchu is not a technical walk in itself, the 4 day tour has been specially designed for people looking for a more exclusive route (less crowded), away from the classic excursions like the Inca Trail Or the Salcantay hike. The Lares walk allows you to see Andean communities lost in time; While you walk along the paths of Lares, you will see how these people live in agriculture, the raising of animals that produce wool and meat and the manufacture of typical handicrafts; Enjoy your hospitality. This trek will not take you to Machu Picchu by the Gate of the Sun (Inti Punku), but will give you the opportunity to board the train from Ollantaytambo to Machu Picchu; So not only enjoy an amazing hike, but also one of the most amazing short train routes on the planet, through the Sacred Valley of the Incas to Aguas Calientes, the town below the Inca city of Machu Picchu. If you want to have an amazing hiking experience, without having to walk for days, you may want to take a short hike in Machu Picchu, these walks take you through the mountains and around Machu Picchu.